As I was driving home yesterday I passed a house which boasted a narrow bed along its north side with hundreds--maybe thousands of snowdrops. I began looking intently (through Capitol Hill mind you--one of Denver's most plant-dense neighborhoods). Surely there must be more bulbs out? A block or two later I saw a fabulous stand of crocuses in the corner of one lot, then nothing in the way of bulbs the next mile or so home. I remember when this was a fabulously expensive bulb a few decades ago (1970's to be more precise). I have rhapsodized about this amazing plant at length elsewhere. 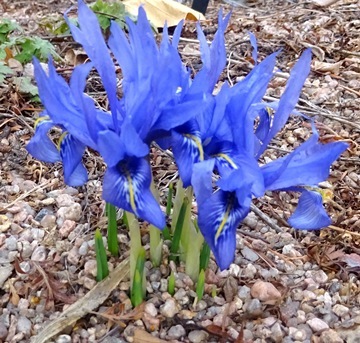 Suffice it to say the several dozen bulbs I planted in my rock garden a few years ago all perished the winter before this one when we had our disastrous April freeze. The ones at the Botanic Gardens came through unscathed. Not that I'm bitter or anything. See these now in glory in the O'Fallon Perennial border. Harmony indeed! Just LOOK at that clump--this one is in the upper meadow of the Rock Alpine Garden. I have not often seen these iris clump up so thickly! When they do, however, they become susceptible to Ink blight--a dread fungus that loves to do in reticulatas. It will be interesting to see if these come back NEXT year...the bulbs are so inexpensive, it's almost not worth the effort to divide these. I have done so right after they bloom when their in full leaf and find it works well. I should have put a ruler next to this monster--it's almost a foot in height! Tucked at the back of the Rock Alpine Garden, George loves this spot and is the largest of its kind I've ever seen. 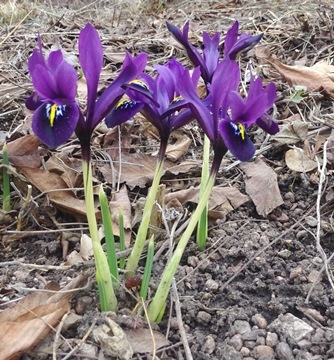 It is (like 'Lady Beatrix Stanley' and 'Katharine Hodkin') likely a hybrid of the true Iris histrioides: which is not available in commerce at all (and may never have been). Except for 'Major', that is: the Dutch select all of these plants for their vegetative vigor: they're all reproduced form bulb divisions. The bulbs that do this best are generally sterile hybrids--as a consequence none of these reticulate irises seem to set seed in Colorado. There are a few wild forms in cultivation (I have a few in my house), and these might actually reproduce from seed in our conditions. Which I would love to see happen. As long as we grow these mules, we shall have to divide them on a three or four year sequence to keep them from overcrowding and dying. 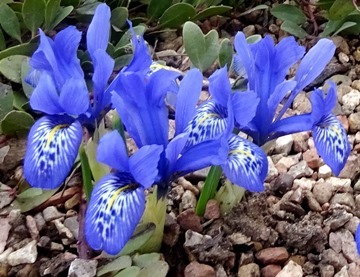 I finish with another classic: the deep purple form of Iris reticulata, growing in the Lilac Garden. These were planted ten or more years ago, and are still thriving. 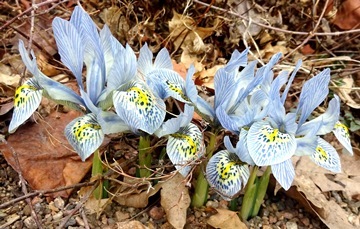 Reticulate iris have been put in their own genus by the great Russian botanist, Rodionenko: Iriodictyon. I have a hunch he's correct. 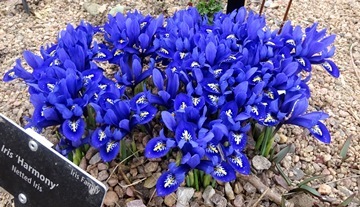 They are as easily grown as crocuses, and far less often seen. I think we're missing out by not planting these on a massive scale throughout our region where they do so well. Once you have several hundred (or let's say a THOUSAND) of your generic, Dutch hybrid reticulatas scampering all over your garden...then and ONLY then you can click on the U.R.L. and see that a vast universe of hybrids is being generated by a mad Canadian I met decades ago when he (and I) were mere babes in the woods horticulturally. I'm speaking of Alan McMurtrie. Some day I'll blog about him more fully. Until then, come wander through the Gardens and marvel at our bulbs, and jot down the ones you would love to see in your garden next spring. Denver Botanic Gardens has online bulb pre-ordering happening now! Here is a catalog of the bulbs that are for sale and how you can order. Get a jump on your spring gardening. Place your bulb order between now and June 22, 2015 to reserve them for easy, hassle-free pick up in September! ‹ Previous Article: Planning an event? We can host it!